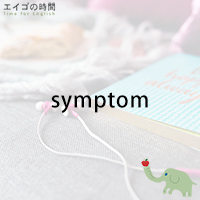 Are you familiar with the word “symptom”? A symptom is a sign that you have an illness. For example, if you sneeze a lot, if your nose is runny, or if your eyes are itchy, it’s likely that you have hay fever. These are common symptoms of hay fever. Likewise, a cough is a symptom of a cold, the sign that tells you that you may have a cold. Most cold symptoms go away after a few days. A lingering cough may mean something else. It could be the symptom of pneumonia. If you have a high fever and body aches, in addition to coughing and sneezing, you should suspect that you’ve got the flu because a high fever and severe pain throughout your whole body are the symptoms of influenza. If your tooth aches, you know you have a cavity. A toothache is one of the most common cavity symptoms. Now. Would you like to try a quiz? You’ll be given three options. Please listen carefully and choose the one that is NOT true. Ready? 1. A cough is a symptom of a cold. 2. A toothache is a symptom of a cavity. 3. Pneumonia is a symptom of a cold.